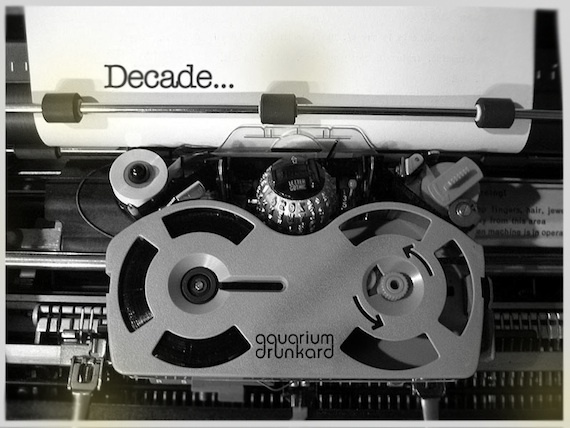 From the beginning of October through the end of December, Monday through Friday, AD will feature a post, or posts, from a particular writer detailing their favorite albums of the decade. On a given week there might be one album a writer talks about, there might be six, but they’ll get a chance to have their say on everything that comes to mind. Our hope for you, the reader, is that you’ll jump in with your comments on the album selections — tell us why you agree or disagree — and also be exposed to some albums that you may have missed over the last ten years. Now, as the decade starts to wind down, let’s celebrate. When Griel Marcus named Sleater-Kinney the best band in America in Time in 2001, they had just released All Hands on the Bad One the year before and would, the next year, release One Beat, a record that simultaneously saw them reaching for the Clash and trying to hold onto something of their distinctive sound. The band had been on a tear since 1997’s Dig Me Out, but something was missing on One Beat. It didn’t seem calculated, nor was it a bad record. It just wasn’t. It wasn’t what the band seemed capable of and it wasn’t what they needed to back up Marcus’ claim. Though they wouldn’t announce it officially until 2006, the band already knew that their next album would likely be their last. So they shifted. They moved from longtime label Kill Rock Stars over to Sub Pop and they parted ways with producer John Goodmanson and instead worked with Dave Fridmann, known mostly for his work with the Flaming Lips. 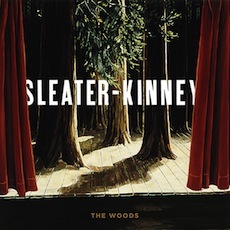 The results, 2005’s The Woods, is Sleater-Kinney’s best album. Full of the classic-rock leanings that had boiled beneath the surface of the band, especially since drummer Janet Weiss came on board, The Woods is a torrential record that unleashed Sleater-Kinney’s songwriting and Corin Tucker’s voice in a way unheard before. Volume is the first thing that strikes you when opener “The Fox” comes in. The record is distorted and in-the-red for most of its running time. Vocals, especially Carrie Brownstein’s counter-vocals that have long wrapped sinuous vines around the feet of Tucker’s, are buried in the mix and this is, oddly, a blessing. Why? Corin Tucker’s voice had always been a powerful, vibrato weapon in the band’s arsenal, but as she gained control of it over the years, she had reined it in quite a bit. Not here. Her control remains, but the sheer power of her vocals, whether just turned up in the mix or not, sound as if she came into the studio a woman possessed. Their placement against the album’s cavernous, gigantic sound puts them into sharper relief than before. The same goes for when Brownstein takes the lead. Songs like “Entertain” give her the room to unleash a righteous fury. The opposite is true for “Modern Girl,” which showcases Brownstein’s gift for more nuanced singing. “Modern Girl” also displays an amazing sense of aural symbolism, its slowly dissolving structure an ideal representation of the narrator’s life that is “like a picture of a sunny day;” not real, but just a distant remove. That’s one of the strengths of The Woods: its ability to be detailed within its massive structure. This is most on display in its closing pair of songs, “Let’s Call It Love” and “Night Light.” The former is an eleven-minute behemoth that welds Tucker’s vocals to a song full of shifting tempo, feedback-driven breakdowns and the closest thing to a jam session you would be likely to hear on a Sleater-Kinney album. “Night Light” flows from this chaos; haunting and serpentine guitar lines fighting against the tidal forces of distortion around them. It draws the album to a close, not with a bang, but a satisfying sigh. I’m ordering the album as I type – this is precisely what a music blog post should do. Nice job. love it love it love it. by far S-K’s finest work and maybe my fave of that year. thanks so much for summing up my thoughts with your words. Thrilled to see this album included in your “Decade”series. It was my album of the year for 2005 and it’s easily in my top 5 for the decade. I still play this album all the time and it never disappoints. It’s a stone cold classic, for sure. People will still have their ears rocked off by this album when they play it in 10, 20 years time. and then there was the farewell tour…talk about going out on a high note!